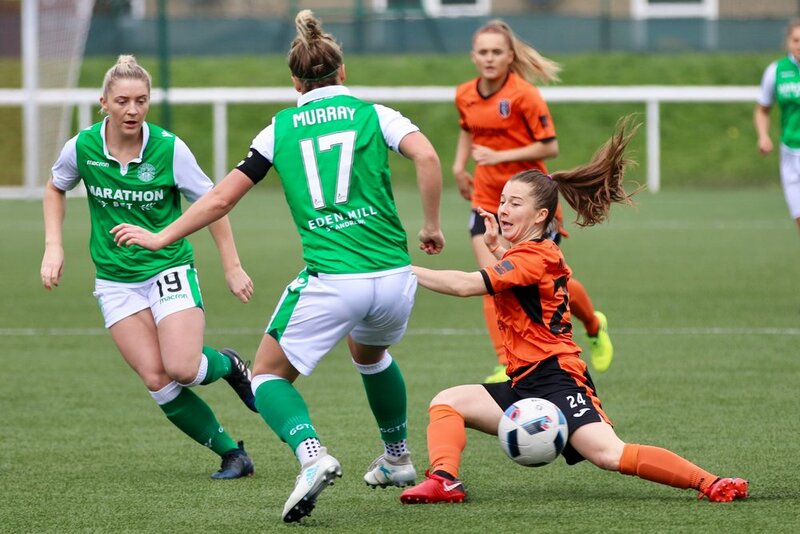 It finished all square in the battle for the Premier League as Glasgow City and Hibs played out a dramatic 2-2 draw at Ainslie Park. It was an entertaining opening period for both sides, with Lucy Graham going close for Hibs before City were denied what looked a clear penalty when Christie Murray was bundled over in the box. Jamie Lee Napier put the home side ahead after 16 minutes when she converted a Emma Brownlie free kick past Lee Alexander in City nets. City responded soon after when Leanne Ross fired home from the spot after Leanne Crichton was fouled by Kirsty Smith in the Hibs box. City enjoyed the majority of the opening spell and could have gone ahead when Hayley Lauder saw her curling effort come back off the junction and Murray and Megan Foley both went close with headers against the side netting, but the two sides went in all square at the break. The second half wasn’t quite as fluent for either side and in the end it was goalkeeping errors which caused the late, late drama. Jenna Fife spilled a City corner with two minutes of normal time remaining and Donna Paterson fired into the back of the net for what most thought would be the winning goal. However, Abi Harrison had the last say when in stoppage time she crossed from out wide and her effort flew in at the back post over the head of Alexander. City are back in action next Sunday at home to Forfar in the League. Kick off is 2:10pm at Petershill Park.